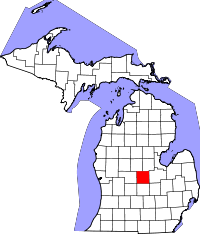 In addition to allowing up to two researchers at a time in the Gratiot County Clerk genealogy research area, the office staff will assist with certain searches. Birth records are available from 1867 until 1880; for records after 1880, the office staff will check via their computer database. Similarly, divorce records are available only through staff computers. Death and marriage records are both open, however, and available from 1867 to the present. Genealogy research hours are Tuesdays and Wednesdays from 10:00AM till 12:00PM and again from 1:00PM until 4:00PM. Specific questions can be emailed to the Clerk's office at clerk@co.gratiot.mi.us, and the office is located at 214 East Center Street, in Ithaca, MI. The County Clerk website lists all of the requirements for each type of record, as well as the necessary form to apply for them. They also direct users to the VitalChek service to order copies of records online.